(Douglas was paroled July 2006 after serving 15 years of his life sentence in Alabama, and has been "released to a quiet life". My name is Douglas Lamar Gray. 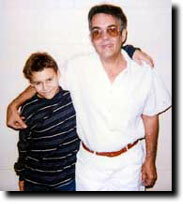 In 1992 I received a life-without-parole sentence for trafficking in marijuana. I bought one pound of pot for $900 from a felon who was released from prison with 30 convictions on his record. He was employed by the Morgan County Task Force and was paid $100 to sell me the marijuana which belonged to the police. I was fined $25,000 and sent to the overcrowded maximum security prison in Springfield (Alabama) with murderers and violent criminals. When I was sentenced, my wife attempted suicide with a pistol because of the emotional and financial stress. Fortunately, she survived, but then filed for a divorce. I was an independent roofing contractor and owned my own business with six men working for me; and sometimes as many as 12. But now I have nothing except my 12-year-old son who needs me badly. But the question is how do I get out of here when the courts don't seem to be interested in justice and common sense. Life behind bars is a lot of punishment for being set up on a pound of pot. I would like you to print my story because all of my appeals have been turned down. I do not have a pre-sentence investigation report in my transcript because when the jury brought the verdict in my case, the judge gave me 99 years right then and there. The DA jumped up and put a motion before the court to sentence me as a habitual offender. I had two prior burglary offenses when I was 17 that were not even serious enough for a jail sentence. And for this third crime, I am serving life without parole because of Alabama's habitual offender laws. My story made the February 1, 1999 issue of Time magazine, and the Atlantic Monthly and Rolling Stone in 1997. I am a 46-year-old handicapped Vietnam veteran with an artificial leg. My life here is wasted and there is nothing at all for me to do but write and try and to get help from concerned citizens mentioned in your paper. I would greatly appreciate you sending me a copy of the Razor Wire, and though I can't afford to donate at this time, I would like to become a member of the November Coalition. Thanks for your time and possible help in this matter. Vietnam Veteran Douglas Lamar Gray had a roofing business in Moulton, a wife and a son. In 1989, he bought $900 worth of marijuana in a motel room and lost everything to prison. Until then, the longest Gray had been locked up was a few months for a burglary in his teens, then two more burglaries in his early 20s. After the marijuana conviction, a Morgan County judge, working from Alabama's Habitual Felony Offender Law, sentenced Gray to life without parole for drug trafficking. A police informant with a criminal record had lured Gray to the motel. Gray bought the marijuana, and drove away into a swarm of police cars. He ditched the pot before they arrested him. He thought he wouldn't be found guilty if the evidence was elsewhere, so he refused a plea bargain. That no one was injured during his crimes doesn't matter. Gray, 49, will die behind bars. Before the drug bust, he had not been arrested in 14 years. "Made real good money, owned my own house, my own land," he said. "Watched my little boy grow up, then they set me up and sold me a pound of pot." Morgan County District Attorney Bob Burrell, who was a prosecutor at the time, declined comment, and the judge who sentenced Gray is dead. The case is so old no one from the DA's office or the clerk's office could find out how much marijuana was involved. Gray says it was a pound. The indictment indicates it had to be at least 2.2 pounds to qualify for a "trafficking" charge, which does not mean he sold any but that he had more than what is considered "personal use" by Alabama's marijuana laws, some of the country's strictest. The state has spent $150,000 to keep Gray locked up. So far. Gray lives in St. Clair prison's medical dorm because a train accident took his right leg years ago. He relies on wooden crutches to get around. The prosthetic leg made in the prison is too painful to wear. Before he was in prison, a specialist fitted Gray with prosthetic legs so comfortable Gray could scramble across roofs. In prison, he makes clocks and jewelry boxes to sell to prison employees. "You've got to have some sort of hustle in here or you bleed your family dry. My grandmother's 87. She can't afford to send me much," he said. Gray's latest heartache is his 16-year-old son. The boy's been getting into scrapes with the law. "He said he was going to get into trouble and come to prison so he could be with me," Gray said. His son lives with his ex-wife, LaVonda Dalton. The couple stayed married the first five years of his incarceration. She took a job at Dairy Queen to support her family. Eventually, the strain of separation broke them, and they divorced. She has remarried. But his imprisonment still upsets her. "I think there's something wrong with the law when there's child abusers and killers out here, and he's locked up for the rest of his life for what he done," she said.